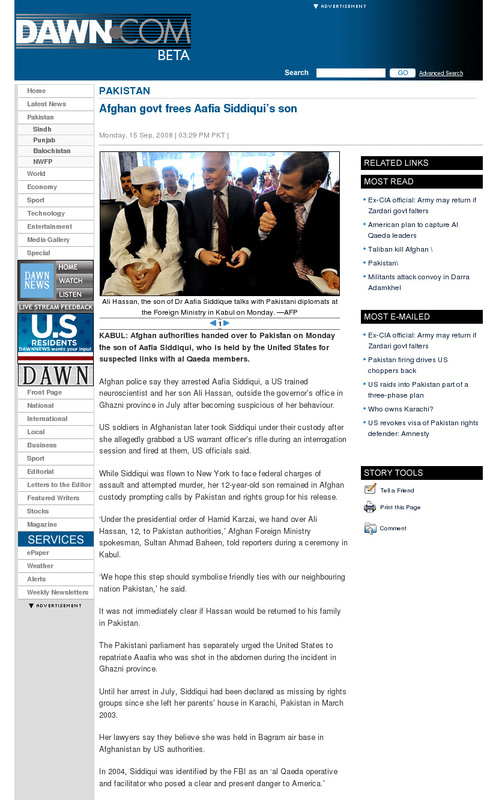 Dawn.com: Under the presidential order of Hamid Karzai, we hand over Ali Hassan (? ), 12, to Pakistan authorities,’ Afghan Foreign Ministry spokesman, Sultan Ahmad Baheen, told reporters during a ceremony in Kabul. ‘We hope this step should symbolize friendly ties with our neighboring nation Pakistan,’ he said. The only anomaly or an accidental typographical error is found in Dawn.com’s report where they have extensively used the name of Ali Hassan as the son of Aafia Siddiqui, which to my best knowledge is not the case, dawn.com goes on endlessly to an extent quoting officials using that name as well. I suspect this to be a minor typographical error and nothing but. We will forever remember what you have done to his mother and the chap. It isn’t a typo, Teeth Maestro, the Afghan authorities are sticking to a story that this is a kid named Ali who was orphaned in the earthquake in 2005. They are now saying Aafia Siddiqui adopted him. That’s why they are using the name given at arrest (She gave the name ‘Salehi’). The cap and jacket are a nice touch, though a towel/turban would have made better PR(opaganda). he looks ok.but we must bring his mother back from bastards. and us in a terrible reckoning very soon. So sad Musharraf sold out our Daughter and innocent children for few thousand Dollars. What ever the name if this innocent boy ali , imran or Imaad he is just 7-8 years have When Pak agencies took custody of Aafia family. Has anyone bothered to ask him when he last saw his siblings and under what circumstances? I know the kid is “disturbed” just like his mother and that inhibits him talking, but the other kids are important aren’t they? Haram zada, namak haram Karzai expects Pakistanis to show him friendship whereas he is gathering Bharatee Faujis in Afghanistan, sure SIR. He looks ready for a suicide bomb attack. They would not say where he has been in last few years with his mother and ciblings because that will expose an AlQaeda camp. Wow, isn’t that forgiving of her? She believes 3 kids and her sister were kidnapped and imprisoned for 5 years but now she doesn’t want to blame anyone? I’m sure she does want him to forget. i dont actually get the point ….why does U.S think that they are the only damn healers for this world….n they actually believe that everyone bows before them…..they always have to poke there bloody nose in every matter….They dont fear the day when Allah would make them suffer…..
That was a very sexist remark Roma. A Woman can be just as threatening as a man. It doesn't take much testosterone to make a bank transfer to fund an attack.